Globally, about 700 million people are faced with inadequate food supplies, with more than 30% of the developing world’s populations living in extreme poverty. In sub-Saharan Africa, as living standards rise, populations grow and urbanization continues. Data suggest that, in the next fifty years, the global population will consume twice as much food as was consumed over the past 10,000 years. The food security challenge requires urgent attention. Enhanced utilization of science and technology for innovation is critical for ensuring increased total factor productivity, enhancing agri-business and ensuring economic growth in SSA. However, what is required are new approaches to research for development and ensuring enhanced impact on the lives of the rural poor. Higher education has a key role to play in training the next generation of Africa’s workforce, producing knowledge products and sharing this with farmers for impact. There are needs for incentives to ensure the integration and increased contribution of universities to development. 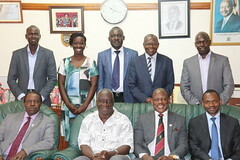 RUFORUM wishes to stimulate further the contribution of universities to bringing about rural change in Africa. Efforts are targeted at stimulating leadership through the recognition of individual professionals on the continent and based at African Universities who are dedicated to strengthening higher education in Africa, in terms of university leadership and management, teaching and carrying out research focused on improving rural livelihoods in Africa. RUFORUM wishes to recognize some of these achievers, and by so doing further grassroots oriented research that has impact on rural communities. RUFORUM, through the Impact Research and Science in Africa or IMPRESSA award, will award outstanding university scientists who have made significant contribution in the field of agricultural research and science for development in Africa, including human and institutional development. 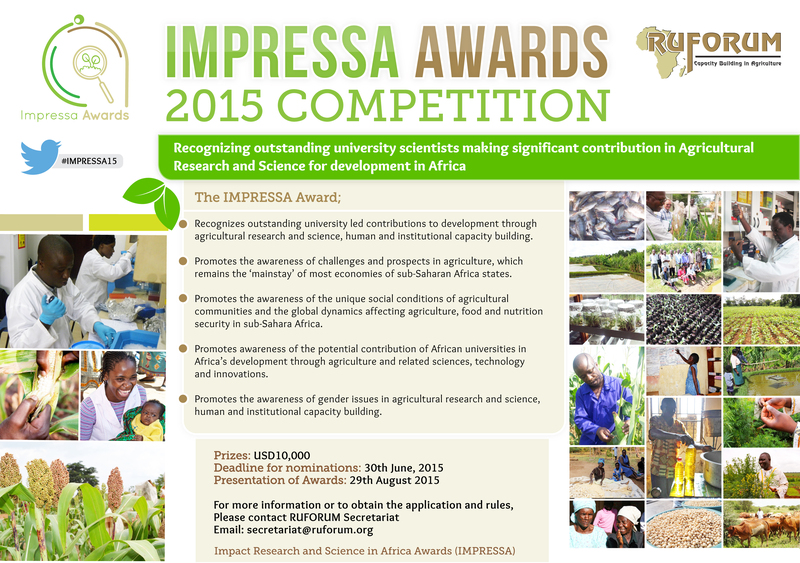 The IMPRESSA Award competition is organized by the Regional Universities Forum for Capacity Building in Agriculture (RUFORUM). The above link is not working: Please click here to download the full call or click here to view the winners of the 2009/10 (Inaugural) IMPRESSA Awards. Apologies. It has been rectified. Please check.